Breakdown: Torres made his major league debut at the end of last season, and also made camp out of spring training this year. Torres was acquired by the Padres from the Athletics in the Yonder Alonso trade. Torres has been pitching well since the start of the 2017 season in the big leagues. He has 11 K’s over eight IP with a 3.38 ERA and only a .50 WHIP. Torres is a hard throwing lefty who generates a lot of swings and misses. He had a breakout campaign in ’16 due to his improved control and command. He has the assets to be a dominant reliever in the bullpen, and only has more room to improve from now until 2020. Torres is the Padres #23-ranked prospect, and is only 23 years of age. Breakdown: Lamet was a rotation candidate out of camp this year, although the Padres elected to keep him in Triple-A for more seasoning. 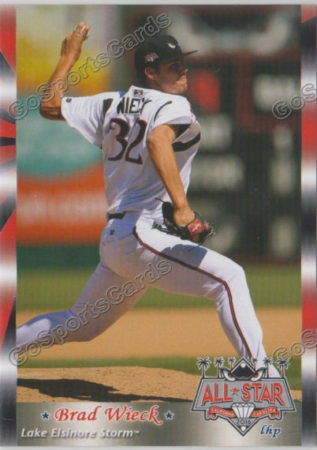 Lamet pitched in three minor league levels over the course of the 2016 season, ultimately ending up pitching for the El Paso Chihuahuas. He is older than most prospects, at 24 years of age, but has plenty of tools to be a successful big league pitcher. He is considered a starter, but has the right tools to be a dominant late inning arm. I see Lamet ultimately being the Padres closer, or 8th inning set-up man in 2020. I don’t see him remaining as a starter because he lacks a useful 3rd pitch. Lamet led the Padres’ system in wins (12), strikeouts (158), and was second in IP (150) and ERA (3.00) last year. Breakdown: The 24-year-old Maton was drafted in the 20th round in 2015, but has exceeded all expectations and has run through the Padres’ system, finding success at every level. The Padres #18-rated prospects also went through three levels in the Padres’ system in 2016, ending up as the closer for the PCL Champion El Paso Chihuahuas. Maton had an outstanding 14.5 strikeouts-per-9 last season, showing a strong ability to miss bats. I see Maton as the Padres’ 2020 closer. 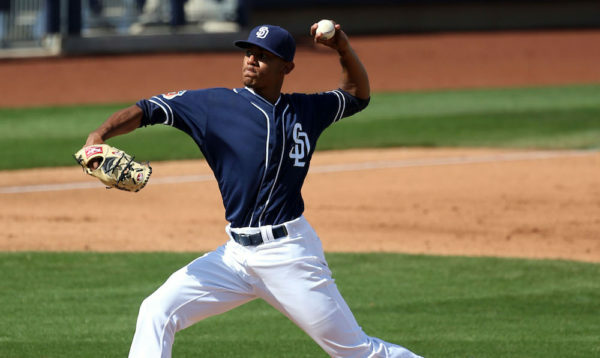 I could see a Torres, Lamet, Maton 7-8-9 innings for the 2020 Padres. That would be a dominant core of young late inning relievers. Phil Maton has great control, issuing very few walks, which could translate to big league success as early as this season. Expect to see Maton make his debut in 2017, and have a big role in the Padres’ bullpen for the next few years. Breakdown: As I mentioned earlier, one of the two would fill the long relief role in the Padres 2020 bullpen, while also making spot starts. I see the two as the 5th and 6th starter in the Padres’ rotation. Breakdown: Hansel Rodriguez is only 20 years old. He was acquired by the Padres from the Blue Jays for Melvin Upton Jr. in the 2016 season. Rodriguez has had command issues, which has lowered his prospect potential, although Rodriguez throws his fastball up to 98 MPH. A 20-year-old throwing nearly 100 is definitely a pitcher to keep an eye on. Hopefully Rodriguez can make major strides in the next few years with his command, and develop his slider and changeup into another useful pitch. 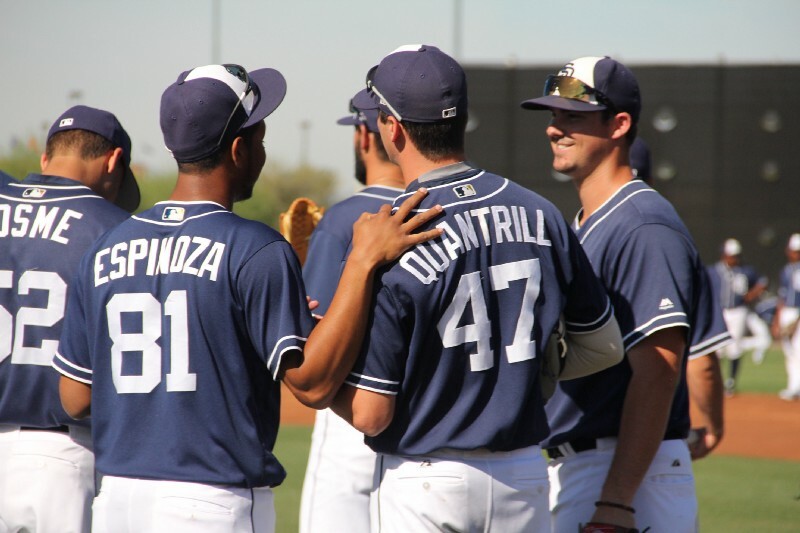 Breakdown: Wieck made a strong statement to be a part of the Padres’ roster this season. He is 6’9″ and has a mid 90’s fastball. He is destined for a big league bullpen spot eventually, and his large stature could be a very solid option for the Padres’ pen in 2020. Breakdown: Keel has been very reliable for the teams he has pitched for in the Padres’ system. Keel is a ground-ball pitcher, who rarely gives up a home run. The Padres selected Keel in the 9th round of the 2015 draft out of Cal-State Northridge. Keel had a 2.97 ERA in 76 innings pitched for Fort Wayne (low A) last season. Keel made nine starts out of 25 appearances, and only allowed one home run over his 76 innings. Keel is also measured at 6’6″, which would be yet another large-statured pitcher out of the bullpen. Expect to see Keel make his MLB debut sometime during the 2018 season. Breakdown: Lucchesi was remarkable in the 2016 season. The 6’5″ lefty had 56 strikeouts and only three walks over the course of 42 innings in 2016. He also had a 1.29 ERA. Unfortunately, this was primarily for short season Tri-City, but he is definitely setting the tone to be a successful big league pitcher. Lucchesi is currently pitching for High-A Lake Elsinore Storm, where he has started two games so far in 2017. He has continued his trend by striking out 11 and walking nobody over nine innings pitched so far. I see Lucchesi going through the system at a very fast pace. I think he ends the season in Double-A, with a good chance to finish in Triple-A. He could make it to the big leagues by the end of the 2018 season, or the start of the 2019. With my potential 25-man 2020 roster, Lucchesi would be the 4th or 5th LHP in the Padres’ bullpen in 2020, which would be considered quite unorthodox. Any of these following names very well could replace just about any of the pitcher on the potential 25-man roster above. The Padres’ system is loaded with pitching, and a name not even listed here could even be a big impact arm on the 2020 roster, who may have been acquired by a trade, draft, free agent signing, or even Rule 5. When trying to select this 25-man roster, I found it very difficult to omit current Padres players such as Yangervis Solarte, Travis Jankowski, Cory Spangenberg, & Ryan Schimpf. I could see the Padres retaining Solarte past the 2020 season as an established veteran who fills the club house with smiles. This is only if he can be retained at the cheap rate he currently has, and continue to produce into his early 30’s. Jankowski and Spangenberg, in my opinion, will be traded at some point between now and the 2020 season, although it is possible they remain with the Padres. The Padres have immense potential in their farm system. I believe there is vast optimism with the current plan general manager A.J. Preller and scouts have developed. The 2020 San Diego Padres will be a team to remember.